In a space history anniversary I missed during the first go-round, 15 years ago today — October 24, 1998 — NASA launched its first mission under the New Millennium Program (NMP) from Cape Canaveral on a Delta II rocket. This first technology demonstrator under the NMP, Deep Space 1, carried new instruments such as the Miniature Integrated Camera-Spectrometer, built to combine visual images with ultraviolet and infrared spectrometer data. It captured images of 9969 Braille, a near-Earth asteroid, and of comet Borrelly. The same launch carried the Students for the Exploration and Development of Space, or SEDSAT 1, spacecraft to orbit. The SEDSAT mini-satellite was built by University of Alabama students to distribute orbital imagery over the Internet. Five years ago today — October 22, 2008 — the Indian Space Research Organization launched a Polar Satellite Launch Vehicle from the Satish Dhawan Space Center, carrying a lunar mapping satellite. Chandrayaan 1, or “Moon Craft 1,” was India’s first lunar mission. The spacecraft achieved lunar orbit on November 8, 2008, after a series of orbit-raising maneuvers. It returned images and data — including from a “Moon impact probe” that it released — until contact was lost in August 2009. Someone will need to explain to me why NASA’s websites have to be shut down — did they shut down the power to the server rooms? — but the fact is that the National Space Science Data Center site came up empty today. But this space history item will not be denied! Five years ago today — October 12, 2008 — a Soyuz-FG rocket launched from the Baikonur Cosmodrome carrying mission Soyuz TMA-13 to the International Space Station. Its crew consisted of U.S. astronaut Michael Fincke, U.S. space tourist Richard A. Garriott, and Russian cosmonaut Yuri V. Lonchakov. The Soyuz docked with the Zarya module two days after launch. Garriott spent nine days aboard the ISS and returned to Earth aboard Soyuz TMA-12, along with cosmonauts and ISS residents Sergei Volkov and Oleg Kononenko, while the other two TMA-13 passengers stayed aboard the ISS. 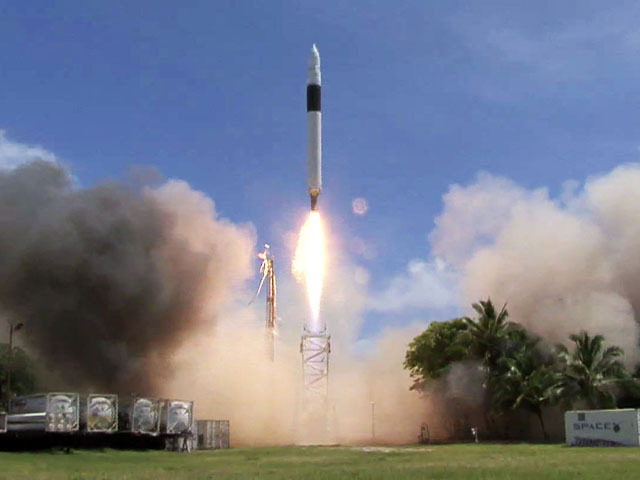 Five years ago yesterday — September 28, 2008 — a Falcon 1 rocket lifted off from Omelek island in the Kwajalein Atoll on its first successful demonstration flight. Its payload, appropriately named Demosat, was a small pathfinder model made of aluminum that was also named “Ratsat.” The dummy spacecraft was bolted to the upper stage of the Falcon launcher, since it did not need to be placed in its own operational orbit. This launch was the fourth attempt for SpaceX’s Falcon 1 vehicle, and the first one to successfully achieve orbit. Five years ago today — September 25, 2008 — China launched Shenzhou 7, their third manned mission,* from the Jiquan launch center on a Long March 2F rocket. Shenzhou 7 carried taikonauts Jing Haipen, Zhai Zhigang, and Liu Boming on a three-day mission that featured China’s first spacewalk to test their space suit design. Interestingly, the space suit itself was named Feitian, after a Chinese goddess who could fly. *Sorry, PC police, but “human spaceflight mission” doesn’t exactly trip off the tongue. Twenty-five years ago today — September 19, 1988 — a Shavit rocket launched from Palmahim, Israel, in the Negev desert. 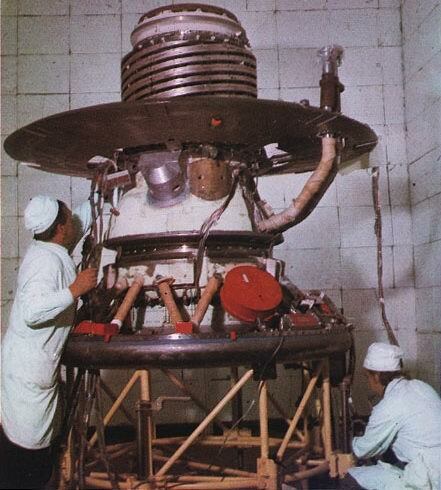 The Ofeq 1 (Horizon 1) spacecraft was a demonstration satellite and the first-ever launched by Israel from its own territory. Ofeq 1 operated until January 14, 1989, when it re-entered the atmosphere. First, a little space history that I didn’t catch the first time around: 35 years ago this week, the Soviet Union sent two missions to Venus from the Baikonur Cosmodrome. The first of the two, Venera 11, consisted of a flyby platform and a lander (“descent craft”), and launched on September 9, 1978. The second, Venera 12, also consisted of a flyby platform and a lander, and launched on September 14th. Venera 12’s course got it to Venus four days ahead of Venera 11: the Venera 12 lander reached the surface of Venus on December 21, 1978, and the Venera 11 lander followed on Christmas day. And to follow up on one of my earliest space history posts which noted the launch, 20 years ago today, of the Space Shuttle Discovery on mission STS-51: 5 years ago when I wrote that entry, I had no idea that a little over a year later I would meet one of the STS-51 astronauts, Frank L. Culbertson, Jr., at a NASA Industry-Education Forum. He was a very pleasant fellow, and well met. Life can be weird and wonderful. Five years ago today — September 6, 2008 — a Delta II rocket launched from Vandenberg AFB carrying a privately-owned remote sensing satellite. Despite being privately owned and operated, one of GeoEye 1‘s main customers for its multi-spectral images is the Department of Defense. You can see a selection of GeoEye imagery in this gallery. And on the same day that GeoEye 1 launched, the Chinese launched two environmental monitoring satellites, Huan Jing 1A and Huan Jing 1B, from the Taiyuan launch site on a Long March 2C rocket. So, 5 years ago today was a good day for remote sensing!